This is part 7 of an ongoing post about my trip to India and Singapore. The previous post is Loving the train station bustle in Agra, India. If you’ve followed my adventures in India, you know that I took the Shatabdi Express Train from Delhi. It was the fastest and most efficient way to Agra, a mere 2 hour trip. And while I got treated to great service and a tasty meal, it may not be the most interesting way to travel. I’ve heard that if you have time, you may want to travel around by car. 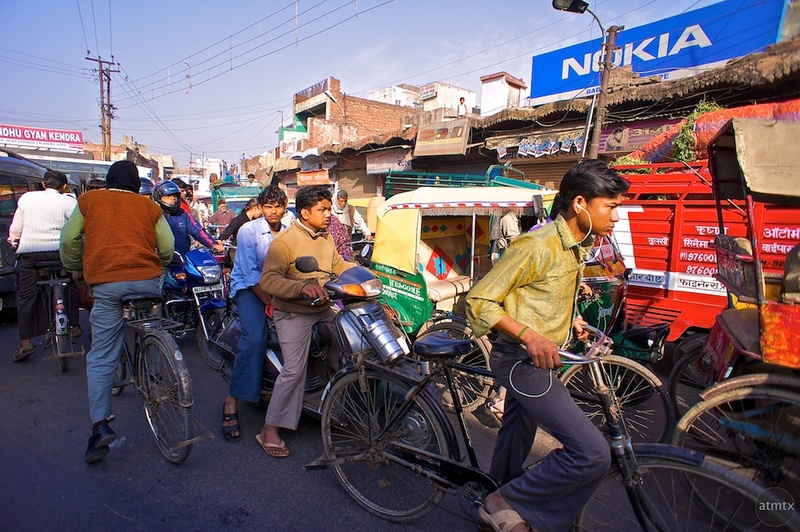 You get to see the life in India up close and it is easier to stop and explore. 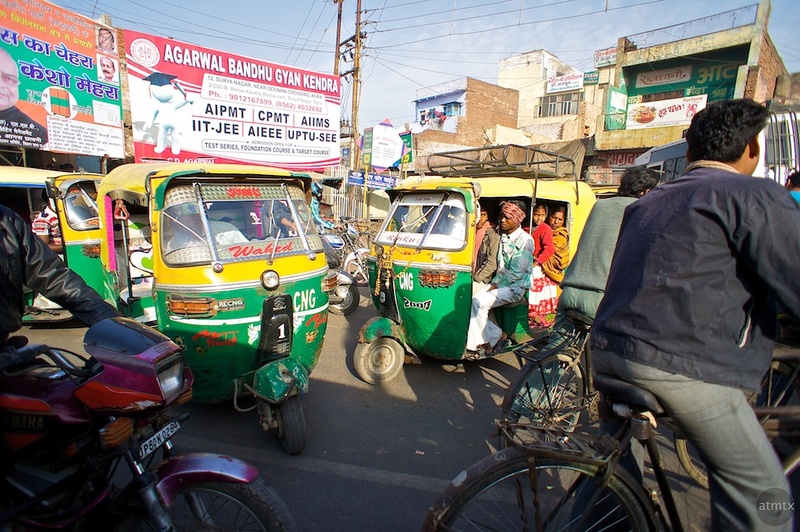 It can take up to 5 hours to get to Agra, however, and I wanted to use my limited time more efficiently. Kind of ironic that even during a vacation, I’m thinking of efficiency. Fortunately, my first stop, Fatehpur Sikri, is about an hour from the Agra train station so I got a small dose of life on the road. 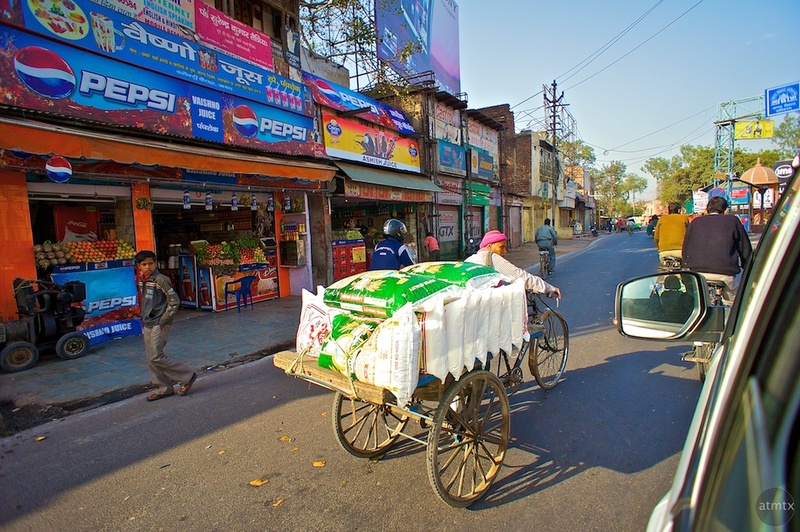 Unlike Delhi, which is a large capital city, Agra is a small agricultural town. The roads are narrower and you get a mix of vehicles that is unmatched. 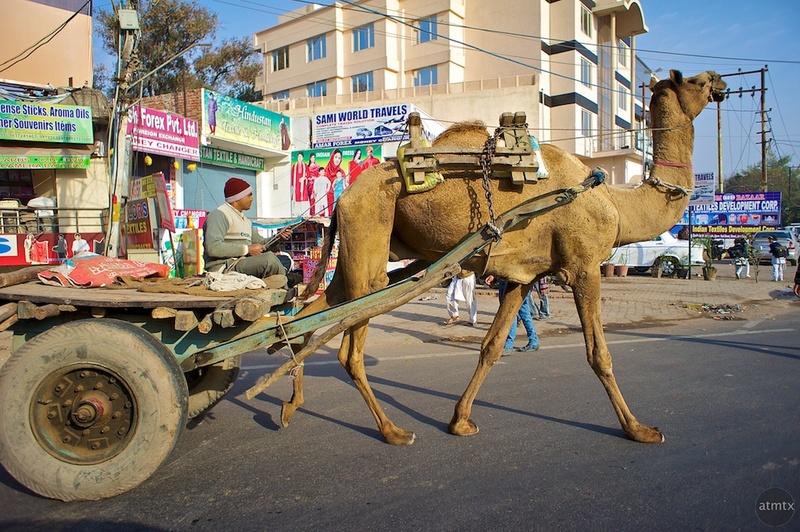 At any given moment, you can be sharing the road with pedestrians, bicycles, motorcycles, auto rickshaws, cars, trucks and the occasional camel cart. The interweaving of these modes of transport is fascinating and I thoroughly enjoyed it. Most of the time, the roads were congested enough that we didn’t go very fast. The ride was more interesting than scary. 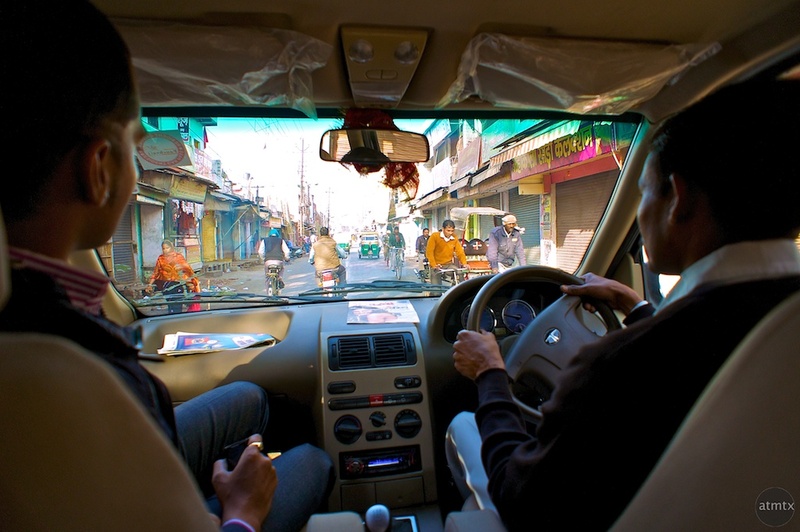 Also, perhaps, after a the night in Delhi, I grew accustomed to the different and unstructured driving style over in India. In the U.S., of course, 95% of the vehicles are cars or light trucks. There is no variety and thus no fun. In Texas, we also drive a lot faster so the world passes by in a blur — no way to enjoy the details of life. The kind of details that are so abundant in India. And though I live in Texas, I never had to share the road with cattle and other livestock. Around Agra, it was not unusual to see a heard of self guided water buffalo walking along the road. What is a bit scary to see is how family members from the smallest child to seniors ride unprotected. 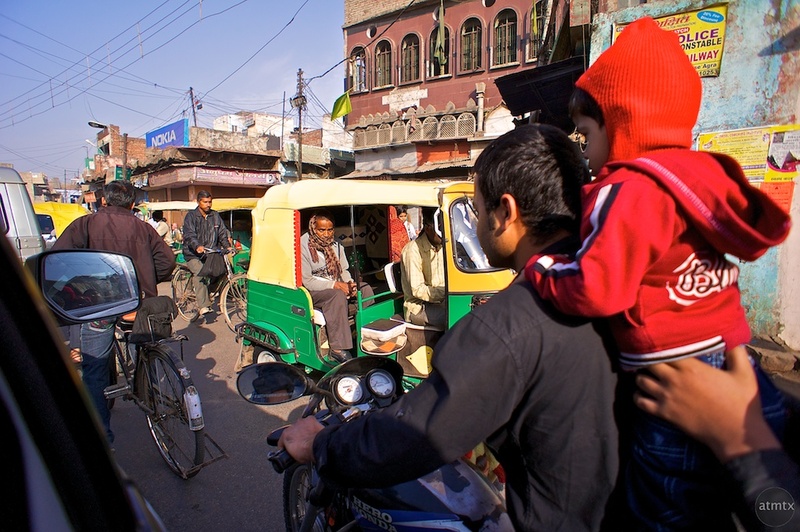 Very few people use any helmets and it is not uncommon to see a child be propped up on the back of someone. We maybe a bit overly protective in the U.S. but the norm is India is quite different. Whenever I go to new places, especially foreign countries, I enjoy taking in the life around me. I’m usually not very interested in museums, I find them too static. I rather be sitting in a café, or a bar or even perhaps a traffic jam. Experiencing, at least for a short time, what it feels like to live in another country. 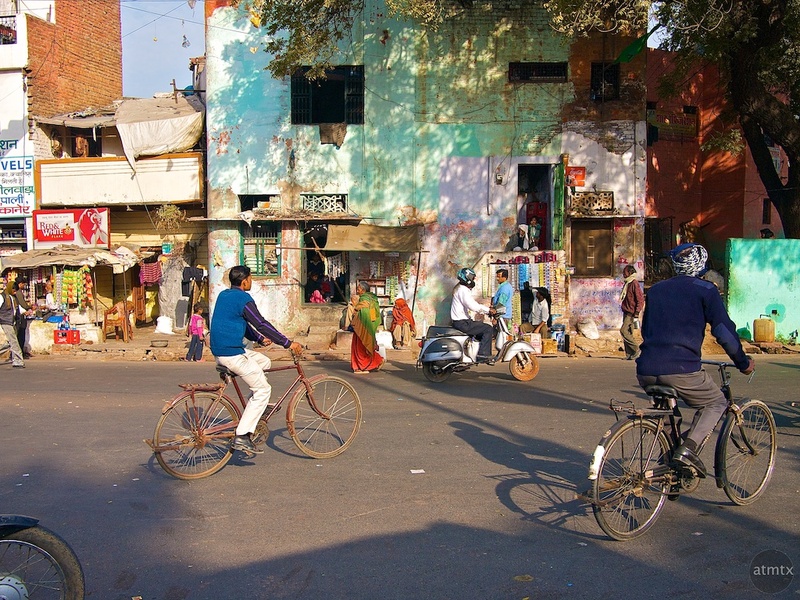 In India, I was lucky enough to live life for a few days as an affluent person. Having a driver and a tour guide was certainly fantastic. They probably thought I was a bit crazy as I bounced from side to side shooting out of both the left and right windows. I was mesmerized and I frantically captured images. It was nice that I had the entire back seat to myself. This post is part 7 of my travels to India and Singapore, Start from the beginning at, Quite possibly a trip of a lifetime and part 6, Loving the train station bustle in Agra, India. Looks like a great trip. But I have a question prompted by the Agra photos. Do you feel the Sony NEX has some difficulty in handling extremes of highlight and shadow? Does the Olympus gear serve you better in similar conditions? Mike, that is an interesting question. I hear that the Sony is supposed to have good dynamic range and the Olympus not as much. In actual use I don’t know if I see that much of a difference. Historically, I’ve been more concerned with color than dynamic range so I probably have not paid enough attention to it. The NEX-5 uses an older 14MP sensor. The NEX-5n uses a newer 16MP sensor that appears to be better.